Is it possible to alphabetically (and numerically) reorder the folders by their names? 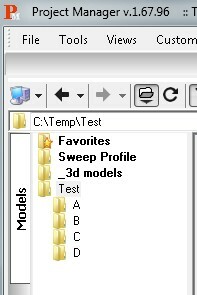 The sorting by name works well inside the folders (models by example) but isn’t there any possibility to sort folders? Was it a dumb question? Sorry, what I meant was the catalogs not the folders. I wanted to sort the catalogs by alphanumerical order. They stay in the order they were created, but I’d like to sort them alphanumerically, in order to be able to place 00_trees above 01_bushes for example. Ok – i will add the ability to order the sub-catalogs with CTRL+UP, Down in the version 2.